The flagship London branch of a dumpling chain. 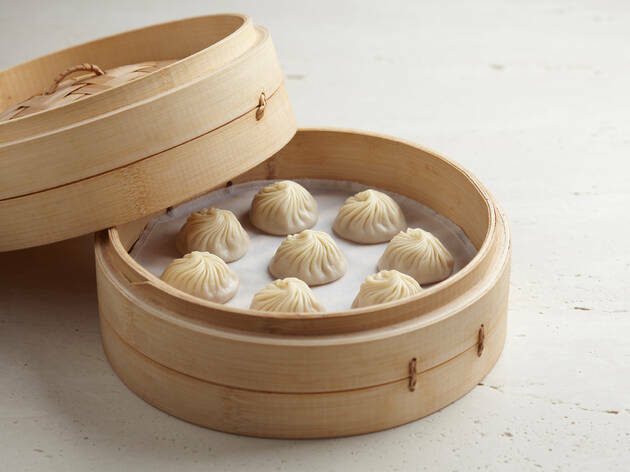 If you’re plugged into social media, or are just a human in London who reads the news, here’s what you’ve most likely heard about Din Tai Fung: a) it was founded in Taiwan by a young Chinese immigrant but now has branches in more than a dozen countries; b) it’s best known for its xiao long bao – Shanghainese soup dumplings – but also plenty of regional Chinese street food; and c) it’s a cult phenomenon, where you should expect to queue. And while a) and b) are true, c) is really just a matter of timing. If you hate to wait, go for an early lunch: at noon on a Tuesday, we walked right in; on a Saturday night, it’ll probably be a different story. But you can drink and snack (space permitting) in the bar area or leave your name and number at the door: they’ll text you when your table is ready. So far, so civilised. Inside, it’s also civilised. This is its London flagship, and smarter than a typical no-bookings chain. You head past a glass-sided kitchen where a swarm of dumpling chefs in surgical masks churn out tiny edible parcels at a terrifying pace. 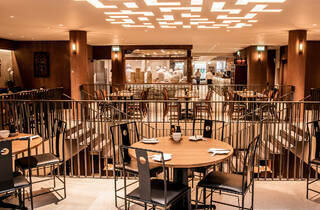 The dining room is an airy spot, tricked out in shades of brown and grey, with a central atrium. Menus are laminated, sure, and the tables wipe clean, but there are ink prints on the walls and orchids on shelves. Service is hyper-efficient, with some dishes seeming to magically arrive the instant we ordered them, though we didn’t feel rushed. But anyway, the food. It’s mostly great. 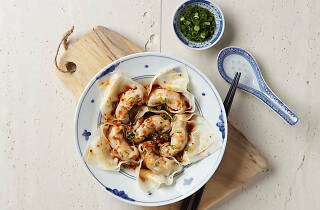 Of the signature soup dumplings, the crab and pork are the ones to order: the sweetness of the crustacean beautifully balancing out the fatty meatiness of the pig. 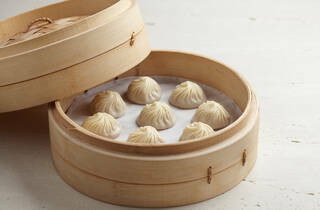 But there’s so much more to this place than xiao long bao. 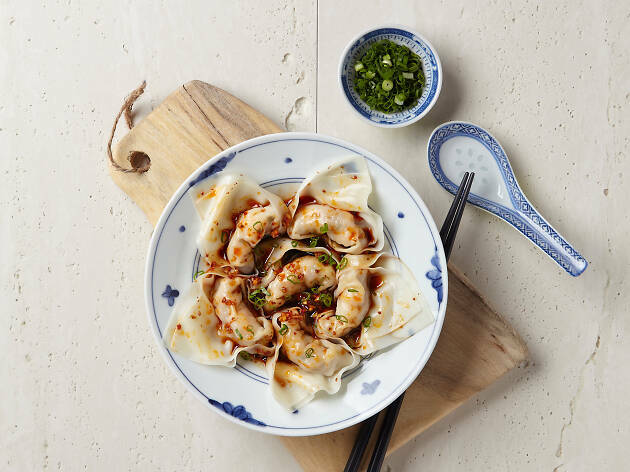 The wontons, for instance, are terrific, in part because of the sheer quality of the wrappers: the freshly made pastry flapping around like fat ribbons of pasta, a blank canvas for the dense, good-quality fillings. The prawn and pork ones with black vinegar and chilli oil are one of the best dishes here. 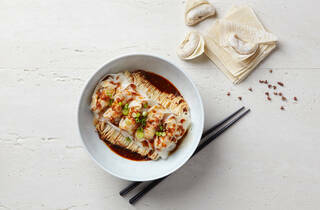 The sauce is fragrant, with just a hint of heat, and thick with braised scallions: it’s seriously addictive. Another must-order is the crispy prawn pancake: imagine a plate of prawn toast but without any of that pesky bread to get in the way. It was bouncy, golden and sweet. A chilled pudding of sago thick with fresh mango and pomelo (a mild, giant citrus fruit) was superb. Just go with the sago. Have faith. Also good was a chilled seaweed and vermicelli salad – chewy, crunchy and fragrant with sesame – and a stack of stir-fried green beans with moreish granola-like morsels of pork and dried shrimp. Only the dan dan noodles, in a sauce that was oddly floury, got the thumbs-down. A meal here will cost more than you’ll pay for similar food in Chinatown, but it’s better quality and in a more fashionable setting. So it’s worth it. Even if you do end up queueing. 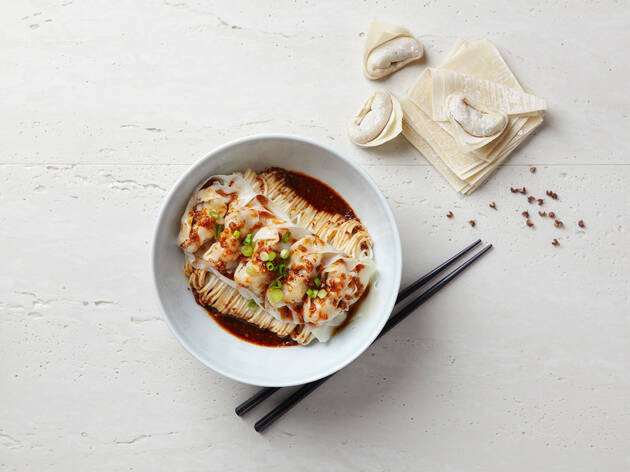 Authentic Taiwanese restaurant, Din Tai Fung will open it's London flagship during the first week of December in Covent Garden. 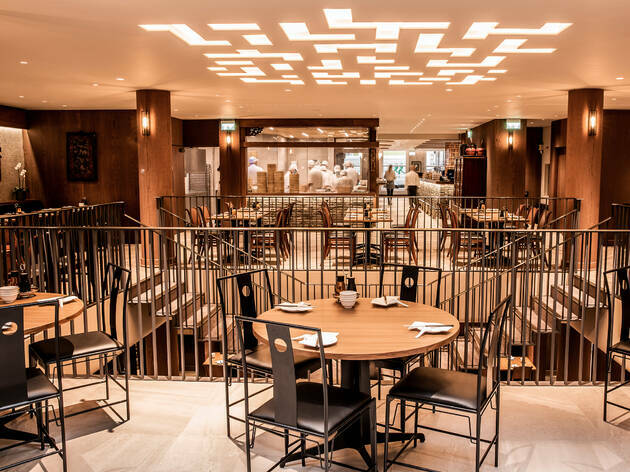 The restaurant will seat 250 guests, offering the signature menu, including its world-famous Xiao Long Bao (Steamed Pork Dumplings) and the first ever DTF cocktail bar! It certainly was expensive. Expensive decor, heated toilets seats. Many, many, many waiters. Unfortunately, the food didn't taste of much. And at the price point, I would expect not to be so rushed. Cannot recommend. Sadly a big disappointment for me, as I was very impressed by the branch in Hong Kong, and was so looking forward to having one more locally. I was happy to walk in with no queue. Sadly, it was overpriced, OK food, with plentiful staff who still manage to be useless. The soup dumplings were tasty-ish, but I’ve definitely had better. Glutinous rice dumplings showed promise, but could have done with some crisping up to give athem a nice crunch. The best thing we ordered was a green veg starter with sprinkled pork - that was delicious and very moreish. Staffing: tables don’t have one assigned waiter, so they all loiter at the edge of the room avoiding people’s eyes. No personal touch at all. 12.5% service charge added automatically, so perhaps no incentive to try. Furthermore, the tick-to-order system works well... until it doesn’t. A beef noodle soup arrived at our table which we had never even considered ordering. Waiter’s only response was to point out the tick mark on the sheet. I wonder if it was pre-ticked, or ticked after we’d ordered - as I have no memory of doing it. If we did tick it, it was very much a mistake. We were expected to eat and pay an additional £13 - by far the most expensive item of the ones we’d picked. On trying, the soup and noodles were tasty, the beef horrible quality. Fatty and chewy. Flexibility in times like these goes a long way to building repeat customers. Had they taken it away and removed it from the bill, perhaps I would be more likely to return. Alternatively, had a waiter taken the time to read through and reconfirm our order, this could have been avoided. As is, I’m glad I tried it once, as I have very fond memories of my Hong Kong experience. However, I think my £60 bill is all I’ll be spending in here, unless I hear that standards have improved massively. First timer inspired by reviews of colonial cousins and David Chang on Netflix (Ugly Delicious). Beautiful interior, huge space to host half of Chinatown and an open view to the kitchen to watch these infamous dumplings be handcrafted with utmost skill. All above would lead you to expect a rainbow of flavours bursting at the seams. Alas - every dish delivered an upmost disappointment I wouldn't expect from a Chinese / Chip shop 'fusion' takeaway. Bland dumplings, overcooked fish and not even delivery of a bubble tea we'd ordered just made for a most expensive displeasure. A meal for two cost min. £60 (excl. drinks) - in fact, we were still hungry but couldn't accept forking out sadistic scores and instead picked snacks from a grocery store nearby. Unsure who taste tests and manages the kitchen but they need to rethink what they want to stand for. Baoziin just down the road is far more reasonable with great flavours! Worryingly, they're opening a second joint at Tottenham Court Rd! My other half was so keen to go here when we heard it was opening in London after he had been numerous times when working in Asia. He was a little disappointed that the prices seem to be a lot higher than they are over there but the food was really very good. The way you are served seems very quirky and different to other Asian restaurants in London and it’s pretty cool to be able to see into the kitchen and watch all the people making dumplings. Definitely a treat given the prices but a good experience and delicious food. If you want to leave with a very full belly be prepared to spend!